Garbage disposals are perfect tools for anyone that needs a safe way to dispose of garbage. They come in all shapes, sizes, models, and power. There are many benefits of using a garbage disposal, which we will talk about in this article. Even if you don’t think you need a garbage disposal, the truth is they can make a huge difference in any home. No matter how you plan on using the garbage disposal, you’ll find a reason why you should get a garbage disposal. Even if you think you know everything there is to know about a garbage disposal, this article will help jog your memory. 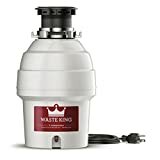 We have also done thorough research on every single garbage disposals on the market, satisfaction rating and dissatisfaction rating as well as its features and offers to come up with the best garbage disposal list for you. 2 What is a Garbage Disposal? 3 How do Garbage Disposals Work? 6 Which Motor Size Fits Best? These are the best garbage disposals based on each motor size. 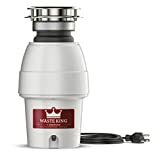 All the highest performing garbage disposal are from two top garbage disposal brands: InSinkErator and Waste King. (Check out all their models and spec in InSinkErator vs. Waste King). Later in this article, you will find out which motor size is right for your needs and things to consider when choosing a garbage disposal in which we use as criteria to judge the best ones in this list. What is a Garbage Disposal? Garbage disposals are devices that sits on the pipes underneath your kitchen sink. A disposal is connected in the middle of the pipes, and typically attach to the dishwasher. A garbage disposal works by breaking down food and other debris into smaller pieces so they don’t clog up the pipes. Using a garbage disposal to get rid of small food scraps or other waste will ensure the pipes don’t become clogged. Not only will they break down your food, but a garbage disposal will prevent food waste from building up at a landfill. Using a garbage disposal to get rid of your food scraps is convenient, and they’re good for the environment. How do Garbage Disposals Work? One of the biggest misconceptions about garbage disposals, is that they use blades. Surprisingly, they don’t contain any metal blades inside the unit. They do have impeller arms that spin and force the food out to the sides. On the sides of the disposal are shredders, which take care of the food. This process actually turns the food waste into a liquid, which allows it to go down the drain easily. Some garbage disposals may need to have water going through the disposal to get rid of the waste. Others, may not need water, but it depends on the model. Here is a video from InSinkErator showing how a garbage disposal works. There are numerous benefits of having a garbage disposal in your home. Though you won’t get rid of waste completely, you will still help the environment and keep your home clean. Here are some other benefits you’ll have to consider when it comes to deciding on a garbage disposal. Considering how much waste is produced by each home, cutting down on the waste you send to a landfill will help. When waste and trash are sent to a landfill, there is a good chance it will build up and create methane. This will increase greenhouse gases, which contribute to global warming. One of the best ways to combat the effects of greenhouse gases is using a disposal to get rid of your waste. Though you can’t put all your waste down the disposal, cutting down on the waste going to a landfill will make a difference. Scraps and other debris can build up quickly in your home. Using a garbage disposal can help you eliminate all the excess waste in your home. When you put food scraps into the garbage, it can sit a while, which can lead to infestations. Whether it’s insects or rodents, any type of infestation is terrible. You may need to put locks on your trash cans or find a different type of trash can. Using a garbage disposal will eliminate the amount of infestations that can appear in your home. Garbage disposals are convenient for any home owner. They save you a lot of time, and they don’t require too much maintenance. Unless you throw something in the garbage disposal it can’t handle, you don’t need to work on it. Most garbage disposals are designed to handle a lot of different types of food, which cuts down on how much time you spend cleaning your home. Any home owner can appreciate how convenient having a garbage disposal in their homes are. If you use a septic system at home, you can also use a garbage disposal. 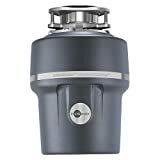 Choose one that is design to be used with a septic system such as InSinkErator Evolution Septic Assist Garbage Disposal. You also need to use your garbage disposal with a septic system properly to prevent from clogging the drain. Saving as much money as possible is part of owning a home, and installing a garbage disposal will free up a lot of your earnings. Not only will they save you money on plumbing bills, but they cut down on your water use. If you’re trying to send waste down the drain, and it doesn’t go down, you may be putting more water down the drain. This will make your water bills become more expensive, and the damage created by the waste will lead to higher plumbing expenses. Adding a garbage disposal will help you save money, in the long-term. There are many benefits to installing a garbage disposal, which directly affect you and your home. When you can make your life easier, it makes owning a home a lot more fun. Just like with most products, there are many types of garbage disposals available, so you should do some research to help you decide which one is the best for you. There is a lot to think about before choosing a garbage disposal, and this section will tell you what you should look for. Batch feed garbage disposals are excellent if you have a lot of food waste. You can put a batch of garbage in the disposal and turn it on manually. This is good for those that produce a lot of waste. You can organize the waste to fit in the disposal, and turn it on when you’re ready. Batch feed garbage disposals are safer than continuous feed disposals, so that is something you should consider. If you like to keep your kitchen clean, placing the waste into small piles will help you take care of the waste all at once. It does take some more time than a continuous feed, but you can get rid of more waste by using the smaller batches. Check out our batch feed garbage disposal reviews. ✓ Includes a cover or stopper to prevent objects from falling into the disposal. ✓ Good for getting rid of small amounts of waste. ✓ Safer than continuous feed because you have more control. ✘ May make you more likely to wait until the disposal is full till you start running the disposal, leading to rotting food. Continuous feed disposals are convenient, and allow you to get rid of a lot of waste at one time. One thing that you will need to consider is safety. Since a continuous feed disposal is always running, you will need to monitor every object near the disposal when it is running. If something were to fall into the disposal while it’s running, it can severely damage the disposal. Aside from that, continuous feed disposals are perfect for homes that generate a lot of waste. You should consider how much waste you need to get rid of before you decide which garbage disposal type you want to get. Though a batch feed garbage disposal may seem like the best idea, continuous feed garbage disposals have a lot of excellent qualities you should consider. Check out our continuous feed garbage disposal reviews. ✓ Perfect for grinding up a lot of waste. ✓ Saves time when you’re cooking in the kitchen by getting rid of waste right away. ✓ Cheaper than batch feed garbage disposals. There are numerous advantages and disadvantages to each type of garbage disposal. To find the best one for you, knowing how you’re going to use it will help you decide which model is better for you. Which Motor Size Fits Best? The motor size will affect how well the garbage disposal works for you. There are several different types of motors you should consider before deciding which one you will need. This section will look at the different motor sizes, and help you decide what size garbage disposal you should get. These garbage disposal motors are going to be the lowest powered motors. For those without a lot of people in their homes, 1/3 HP motors will suffice. You can only grind softer foods in these garbage disposals, which makes a difference. Another thing about these motors is that they jam easily. They are some of the cheaper motors available, but that means they are more likely to burn out or rust in the future. You should only use this type of motor if you’re not planning on using the garbage disposal too much. Soft fruits and vegetables are the best to use for this type of garbage disposal. While still not the most powerful motor, this motor is suitable for most applications. It is affordable, and works well with most standard home uses. They do have stainless steel components, ensuring the parts won’t rust out. These are the perfect types of garbage disposals for most people, and they will get the job done. For reliability, you can’t go wrong with ½ HP garbage disposal motors. They are sufficient, affordable, and they can handle most practical uses for your home. Though you will need to avoid putting certain foods inside the disposal, this will do the trick. They are quite common, so if you do need to find a motor, you can find them easily. For larger homes, ¾ HP garbage disposal motors are ideal. There are a variety of applications this type of garbage disposal will do, making them more universal and practical. They don’t jam easily, and they have a lot of safety protection features, making them practical for any home. They don’t produce a lot of noise, which is good when you’re getting rid of a lot of waste. It has a larger capacity than a ½ HP, allowing you to get rid of more waste quickly and easily. You can also find the disposals with stainless steel parts, ensuring they will last longer than other types of garbage disposals. 1 HP motors are going to be the most powerful motors on the market. They can handle heavier uses for your home, and have a large capacity to handle most types of waste. You can grind a lot of food at once, and you can grind chicken bones or coffee grounds. They don’t jam easily, which is good for grinding smaller amounts of waste. They are larger than other types of garbage disposals, which means you’ll need more space under your sink. If you spend a lot of time cooking at home, using a 1 HP garbage disposal will ensure you can take care of the waste right away. As with many products, you should consider the different factors of choosing the right unit for your needs. There are several things you will need to consider before choosing a garbage disposal, and this section will cover everything you will need to know. Many people get turned off of garbage disposals because they produce a lot of noise. When it comes to choosing a garbage disposal, you should consider the noise levels. Anything smaller than a ¾ HP motor will produce a lot of noise, which will make you consider which type of motor to get. While there is going to be some noise produced by the garbage disposal, you can find one that isn’t too loud. You should also consider what you’re going to put in the garbage disposal before deciding on one. Different garbage disposals are going to have different anti-jamming features, and you should find one that includes these features. This will make sure that anything you put into the garbage disposal won’t make it stop. This is crucial if you have a lot of waste to get rid of. Though some things shouldn’t be put into the garbage disposal at all, you can put a lot of different types of waste in the disposal. Having anti-jamming features will ensure the disposal works perfectly. You should consider whether the garbage disposal has a septic system to help you get rid of your waste. There are models available that allow you to put any waste into the disposal, which sends it to a septic field. There is a liquid enzyme that allows the disposal to break down the food, making it safe to send to a septic field. These types of disposals are perfect for those that need a disposal for their septic systems. Check you this guide to using a garbage disposal with a septic system. The size of the garbage disposal is important. You want to make sure you have one large enough to do the job you want it to do. While some people may prefer a smaller disposal, you should consider how much waste you’re going to put into the disposal. While homes with only one or two people won’t require disposals that are too big, getting a disposal that is too small won’t help you. When it comes to determining the right size, you should look for a disposal that suits your needs. Choosing the right garbage disposal includes the parts inside the garbage disposal. You should make sure there are stainless steel parts inside which won’t rust away or get ruined by lots of use. You should make sure the parts include a warranty, just in case something does happen to the disposal. The best way to ensure the garbage disposal is right for you is to make sure it has the right parts for you. Ensuring the garbage disposal includes stainless steel parts will ensure its longevity. Many garbage disposals include a warranty, but you want to make sure it covers everything you need. This includes parts, labor, and in-home warranties. You can get a warranty from the manufacturer, or through a third party. The warranty should allow you to use it when the disposal breaks, and everything is covered. You can call the manufacturer to find out what is covered. Not only that, but you should also make sure the disposal has a lengthy warranty. Some only cover you for a couple of years, while others have extended warranties. Cleaning out a garbage disposal can be a lot of work, so you should make sure the garbage disposal is easy to clean. You may get some parts that can make it easier to clean the disposal, or find instructions on how to clean it. You should make sure the garbage disposal has everything you need to make sure it is cleaned out properly. This will extend the life of the disposal, and ensure it is ready to go when you need it to. Learn how to clean a garbage disposal and its smell? Garbage disposals are ideal for any home, and they provide a lot of benefits for any homeowner. No matter how you plan on using a garbage disposal, you want to know it has everything you need. You can determine how you’re going to use the disposal, and find out whether it is suitable for your needs. There are different things you should look for when choosing a garbage disposal, but the good news is that there are plenty of options available. How to Clean a Garbage Disposal and its Smell? How to Use a Garbage Disposal?